« So I owe you a postcard, right? This talk was great. The part I enjoyed most was probably when she talked about loving the gospel she said that love was given by holy ghost as we gain knowledge and live ny it. That brought to mind those times that I haven’t loved the church or responsibilities along with it I thought of what I had been doing during those times and how it lined up with times I wasn’t learning and living the gospel. I realized what a great guide to check how were doing in the gospel, do we love it or does it feel more like a burden. This was a memorable talk for me. First, because when Sister Dibb told the story of Brooke dying, my 4-year-old daughter looked up and said, “Mom, I’m drawing you a picture so you can keep it after I die and it will make you happy.” Kids show they are listening at the strangest moments. We had a discussion about how usually – not always – but usually parents die before their children and that hopefully neither of us would die for a long time. Second, because Sister Dibb’s T-shirt story and her own catch phrase, “I’m a Mormon. I know it. I live it. I love it” was easy to remember. But really I had missed many of the little nuggets in her talk until I re-read it. “Conversion and confidence are the result of diligent and deliberate effort. It is individual. It is the process of a lifetime.” Do you know someone – or many people – that exude that conversion and confidence? I do, and it’s something I desire to have more in my life. I, too, “[love] knowledge for its righteous power.” This quote reminds me to continually learn everything I can. I was thinking about this the other day, that one gift I hope I can instill in my children is a love of learning. “This process of true repentance and forgiveness strengthens our testimony and our resolve to obey the Lord’s commandments and live our life according to gospel standards.” This has been so true in my life. I have been trying to comfort a friend who is working through repentance and is really beating herself up for making some mistakes. I think I’ll share this quote with her. I’ve been studying the New Testament and one of the things that has really struck me as I’ve re-read the gospels is how quick the Savior is to forgive and heal. I think our human nature feels like we need to suffer for a certain amount of time before we can be forgiven. There is a lot of suffering in sin, but the Savior’s hand is always outstretched offering us forgiveness and peace as soon as we turn to Him. Thank you for sharing that link. I had forgotten that it was included. A FANTASTIC talk by Elder Oaks that I can’t wait to share with my family!! For me, her point about focusing on what truly matters stood out for me. As my life has morphed in the last year, I have found it harder to stay focused. I use to enjoy an hour of scripture study in peace and quiet. I was enveloped in a feeling of peace and love and learning. Now, I’ve joined the work force and find it difficult to stay focused and prioritizing. Strange how the one thing that will bring me greater knowledge, peace, and strength is the one item I push to the end. I agree with Megan, we are being asked to push further beyond our status quo so we might become the powerful people that God designed us to be. It’s everywhere. Joseph Smith lamented that there was so much more light to teach us but he couldn’t because we weren’t worthy of it yet. That further light and knowledge is still waiting for us. God wants us to push past just our testimonies and truly seek so He can give us more knowledge. It will come in the form of personal revelation. I’ve deviated off of the topic too much. Thanks for letting me share. I loved this talk too, especially after Elder Cook’s talk. I try and picture myself wearing a t-shirt that says “I’m a Mormon. I know it. I live it. I love it.” It frightens me a bit because that would be a big responsibility to declare to the world who I am and have everyone watching. But then the world is watching and I am proud and want to share the gospel so why is it scary? I went and read Elder Oaks’ talk she suggests at the end and I enjoyed it too. Do we dedicate as much time to the church and our testimony as we do to the things of the world? I am guilty of this. It is so easy to get caught up in what is going on in life, trying to keep up with your neighbors, that you lose sight of what really matters. It seems like the general authorities are really wanting people to step up. Gain a stronger testimony, be truly converted, do more, be more. My mom is a great example of using gospel knowledge. She has been a seminary teacher and really knows the scriptures. I am amazed when in a normal everyday conversation she can tie anything into the gospel. She ties it back to being like the Nephites, or a parable that Jesus taught. Random stories that she sees differently. I need to be more like her. She thinks heavenly while I think worldly. It is just a matter of where are minds are. “such confidence..is the result of diligent and deliberate effort.” This reminds me of Elder Cook’s talk and being 100% committed. Perhaps the days are behind us when we can just subconsciously make the effort to be good and righteous people. We now must be deliberate and conscious of the choose we are making. Another thing that ties back to Elder Cook’s talk was the “I know it.” We must not let the “good” things of the world push out the “best” things of the gospel. I also wondered as I read this if I am doing all I can to raise my children to be as confident as the 15 year old was who Sister Dibb meet at the grocery store. Some thing for me to think about. I was again struck by the mention of focusing our time and energy on this that matter most. 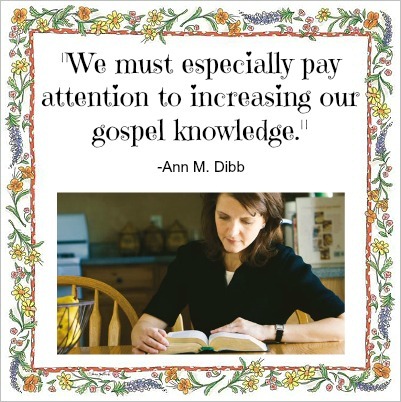 “Are we as well versed in gospel truths as we are in our studies, careers, hobbies, sports, on our texts and tweets?” “Amidst the constant distractions of our daily lives, we must especially pay attention to increasing our gospel knowledge.” Great reminders for our family right now! And the main point, I think, of her talk was this: “Conversion and confidence are the result of diligent and deliberate effort.” And we must be doers of the word, not hearers only. I was struck in the story about Brooke who died. Her mother talked about the great gift that her daughter gave her every day of her life by being a righteous daughter. I think that it is easy for me to take that for granted. I have been blessed with children who, so far, have chosen to follow the teachings and principles we have tried to instill in them. And sometimes we act as if that is a given – that is how it should be, so we don’t give them much feedback for it. I was reminded that I need to make sure that my children know how much I appreciate their good choices in their lives, the examples they set and the effort they put forth to live the gospel. I can’t take it for granted that they know how much that means to me as a parent. Sister Dibb was talking about times where we may feel that our vibrant enthusiasm for the gospel has faded. She said “Whenever I have this feeling, I know I need to refocus my efforts on increasing my gospel knowledge and living gospel principles more fully in my life.” What a great proactive, problem-solving way to live life.